The long-awaited Exhibit Residences has finally arrived, with project details unveiled to Brokers this week. 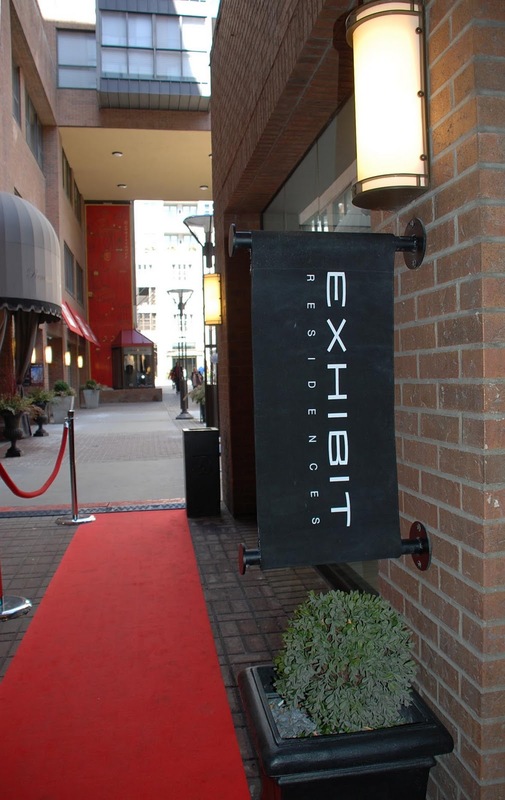 Exhibit will be located at 200 Bloor Street West just west of Avenue Road. Designed by Rosario Varacalli, one of Toronto’s premier architects, Exhibit will rise up as four cubes, each slightly rotated and veiled with fritted glass. It is designed to artfully compliment, and contrast with the Royal Ontario Museum crystal structure, and the vibrant Bloor/Yorkville lifestyle. In addition to its proximity to the restaurants in Yorkville and luxury shops on Bloor, Exhibit offers suites which boast views overlooking lush green residential neighbourhoods to the north, and the ROM, Bloor Street, U of T, Queens Park and downtown Toronto to the south. The building features an outdoor garden oasis on the 9th floor, along with other amenities such as lounges and a party room, just to name a few. Suites in Cube ONE through THREE are equipped with Miele appliances, hardwood flooring, deep soaker tubs and more. Cube FOUR rises above all with exclusively-designed European-inspired kitchens incorporating Miele, Sub-Zero and Wolf appliances, along with unobstructed panoramic views which can be enjoyed from the building's many oversized terraces and wrap-around balconies. A project by Bazis, Metropia and Plaza, tentative occupancy begins May 30, 2014. The sales centre will soon open at 162 Cumberland Street, with prices starting from the $500,000’s. For more information, call 416-967-7778 or visit the Exhibit website at: www.exhibitresidences.com. 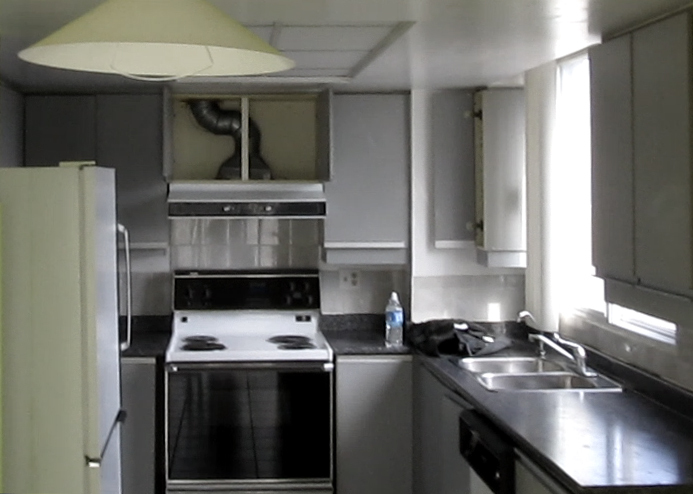 In this third part of this condo renovation series, we follow up today with Simon's kitchen renovation in the overhaul of his 20-year old condo unit. Because Simon wanted to move in as soon as possible, the kitchen was first to be completed after preparation and teardown. Contractors installed electricity and lighting, drywalls and tiling for the floors. Aside from the fridge, all appliances and the kitchen sink remained in their original locations. There were some unanticipated changes due to the placement of bulkhead, piping and wiring. Cabinets were purchased from IKEA ($4,000) and granite countertops were ordered separately ($2,600), then installed by Simon himself. any other IKEA furniture – just follow the instructions. Once the appliances were installed, the balance of the kitchen renovations were held off and completed towards the end of the project (e.g. backsplash and other minor items). The process: IKEA provides kitchen planner software that allows a you to build and customize your kitchen, figure out exactly what to order and the costs involved. Exact measurements are key. Once the plan is finalized, a complete item list is created along with total cost. From there, you'd simply print the list and bring it in to IKEA. For Simon, most items were in stock though a handful of items had to be ordered from IKEA's Montreal warehouse (no additional charge). Once the kitchen was in a functional state, the next order of business was the installation of flooring. Engineered hardwood flooring was installed through the main living areas. Tiling was chosen for the foyer and bathrooms and installed by the contractor. At the same time, Simon installed hardwood floor in the living room and bedrooms himself, replacing the original carpet. Given the condo's requirement for the use of approved floor insulators, an inspection was completed by Condo Management while the installation was in progress. Once all flooring was in place, the unit was painted, then baseboards and crown moulding were added by the contractors. Installation of hardwood flooring is easy as long as you have the proper tools and know-how. The total cost of flooring chosen was $4,000. Third-party installation quoted an additional $2 to $3 per square foot. There are many websites which provide instructions (here's an example from Home Depot, one of thousands of online sites with DIY information). Tune in next week for the final part of this four-part installment when we discuss Simon's bathroom renovations. IKEA's BILLY Bookcase is a tried-and-true favourite and it's sale for 4 days only! From March 31 - April 3, you'll find this handy shelving unit on sale for only $49* (regular price $69). This quintessential furniture staple functions beautifully in any setting, with a wide variety of sizes and colours to suit any style. While it's perfect for your living room, home office or bedroom, it also makes for perfect shoe storage! *Applies only to the 31.5" x 11" x 79.5" size in black or white, while supplies last, limit 2 per customer. The official groundbreaking ceremony of Emerald Park happened this morning at the highly anticipated Yonge and Sheppard site. A project by renowned developers Bazis, Plaza and Metropia, this 550-unit, two-tower condo development will feature residential, retail and commercial space. Residents will enjoy access to a spectacular exclusive club space, reminiscent of an international resort. This condo will also include its own internal connection to Sheppard subway station through a glass-enclosed walkway. Attendees look on, anticipating the official groundbreaking. The graceful towers evoke the feeling of two tall blades of grass swaying in the breeze, as suggested by architect Roy Varacalli at this morning's event. We can't wait for this 78,000 sf site to make its mark on the highly-coveted Yonge and Sheppard neighbourhood. Interested? You can still benefit from pre-construction pricing on the 50 remaining suites, from $419,900 for a 2BR + Den unit of 812 sf to $679,900 for a penthouse suite of almost 1,200 sf. Click here for more info or contact Emerald Park now. If your condo needs a little pick-me-up this season, consider breathing a little life into your home with some fresh foliage. Monstera leaves are a simple, modern way to liven up any space. Consider placing them on a coffee table, fireplace mantle or console table. Having a dinner party? They also make for easy and beautiful centerpieces. Monstera leaves can be purchased for about $20 for a set of three, and should last about a week. This week, let's head to the upscale Bayview VIllage community in North York for a closer look at Shane Baghai's St Gabriel Village, located near Bayview and Sheppard. Completed in January 2009, this luxurious two-tower high-rise development offers its residents a range of incredible lifestyle amenities including valet parking, 24-hour concierge and a well-appointed fitness centre. This condo's ideal location is within walking distance to the Sheppard subway line, Bayview Village Shopping Centre and the YMCA. The building is also situated within very close proximity to major commute arteries. In the past 60 days, a total of four units have sold at St Gabriel Village with prices ranging from $637,000 for a 2-BR unit of approximately 1,270 sf to $1.38M for a 2,495 sf 2+1 suite. These properties spent an average of 25 days on the market. For more information on St Gabriel Village, please click here. In case you haven't yet received our weekly newsletter, we've pasted just a snippet of this week's new condo development updates below! Please subscribe to receive project updates directly in your inbox every Thursday morning. As a follow-up to the background we provided last week on Simon's condo, today we'll discuss the process he went through in preparation for the renovation work, including condo management approval, contractor selection and demolition. Permission for Simon's planned renovations was requested from his Condo Management office. A standard form wasn't required and as a result, Simon simply detailed the work to be completed, providing photos of the sub-penthouse unit he'd used as a model. Being that this building was 20+ years old, the condo management team was accustomed to owners completing major renovations. The only requirement from Condo Management was the use of pre-approved floor padding under the new wood flooring. Simon's unit was subsequently inspected to ensure this guideline was followed; otherwise, no other inspection was performed. Hints & Tips: A newer condo board and/or management team may be more stringent. with respect to renovations. Residents in newer condos may not be as understanding. Provide as many photo examples of your plan as possible, along with a mock-up of your planned renovations using a current floor plan that outlines major revisions. Hints & Tips: Given the frequency of renovation requests in an older building, written approval may not be necessary; however, you should always request approval in writing to be on the safe side. Simon was referred to a contractor by a friend and thus had the opportunity to examine the contractor's work prior to hiring him. Hints & Tips: A contractor referral from someone you trust is always the best way to go, but that's not always available. In the past, Simon had scoured websites that provide contractor reviews and ratings, such as homestars.com. Before any work was started, all existing flooring was removed, walls that were to be displaced were broken down and kitchen cabinets were taken out. Simon and a friend completed the demolition and disposal themselves, without the help of a contractor. Simon sold his old kitchen cabinets and appliances online via Craigslist and Kijiji to buyers who picked up the items from his condo; this allowed him to save on the additional cost of removal or disposal. All other debris that could not be salvaged was disposed of at a municipal disposal facility where he was charged $0.10/kg for disposal from Simon's location (City of Toronto). Total debris for his demolition totaled 2,000 kg, resulting in an overall charge of $200. Next week, we'll explore Simon's kitchen renovations. With the rising temperatures comes a surge of activity in the real estate market. If you’re selling or considering the sale of your condo this spring, you’ll want to optimize your space for showings. Aside from the more obvious preparatory clean-up and perhaps staging, keep in mind these simple yet often overlooked tips that will keep your suite in shipshape for showings each and every day. This week, let's head to North York for a closer look at Spectrum Condos by Menkes, conveniently located in the popular Avondale community near Yonge St and Hwy 401. Completed in September 2002, this high-rise development offers its residents a range of well-appointed amenities including 24-hour concierge, fitness centre, party room, guest suites and plenty of visitor parking. This condo's ideal location provides residents with ease of access to public transportation and major commute arteries. There are also many shops and restaurants nearby, including a 24-hour Rabba grocery store and Starbucks. In the past 30 days, a total of four units have sold at Spectrum with prices ranging from $268,000 for a 1-BR unit to $361,000 for a 2-BR suite. These properties spent an average of 9 days on the market. Two units were also leased at Spectrum in the past 30 days, ranging from $1,250 for a 1-BR suite to $1,650 for a 2-BR suite. These rental units spent an average of 41 days on the market. 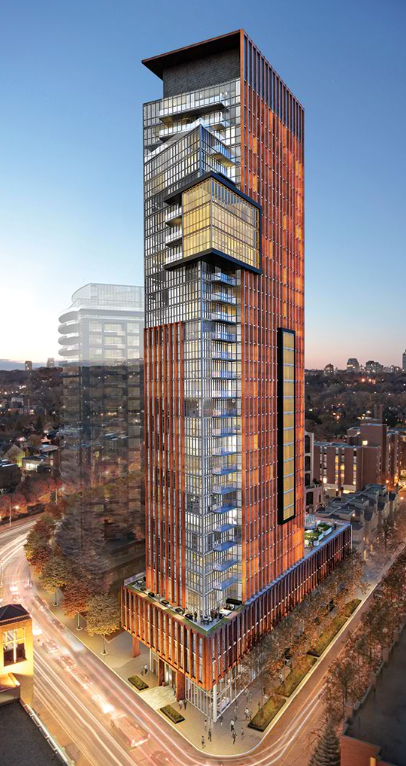 For more information on Spectrum Condos, please click here. Did you receive our New Condo Development Updates this week? If not, please consider signing up here for the full newsletter. Our VIP subscribers receive new condo development updates delivered straight into their inboxes every Thursday morning. Here's a little snippet of this week's newsletter. Enjoy! > Introducing the Yorkville Condominiums! Got the winter blues? Tired of being cooped up indoors? Now’s a great time to consider a simple outdoor DIY in anticipation of warmer days ahead. If you want an easy and effective way to spruce up any condo balcony or terrace – no matter how big or small – then start from the ground up! Improving your outdoor flooring requires minimal effort yet provides maximum impact. These resin Balcony and Deck Tiles by EON warm up any outdoor space with the classic look of cedar wood, but require no maintenance. Each tile measures 1' x 1' and won't crack or fade over time. No preparation is required and the tiles snap together for easy assembly., making installation a breeze. $29.99 for a package of four, sold exclusively at Canadian Tire. These Modulette tiles from Designer Deck are available in a wide variety of materials, finishes and colours to suit any taste. The ones pictured above are made from recycled plastic, though wood varieties are also available. These 2' x 2' tiles can be installed over irregular surfaces, and can also be cut to fit irregularly-shaped condo balconies and terraces. Installation is a snap with a "friction fit" (pieces fit together similar to a jigsaw puzzle). HandyDeck's EzyTile line offers a wide range of granite, slate, sandstone and porcelain tiles to add some unique style to your condo balcony or terrace. Like the two previous options, these interlocking 1' x 1' tiles simply snap into place without the hassle, frustration or mess of conventional installation methods. Wooden tiling options are also available and products can be ordered online, starting at $7.80 USD per tile. This week, we're heading uptown for a closer look at 18 Yorkville by Great Gulf Homes, located in Toronto's exclusive Yorkville neighbourhood near Yonge and Bloor streets. Completed in November 2005, this high-rise building offers its residents a range of well-appointed amenities including a fitness centre, party room and rooftop terrace. This condo is ideally situated in the heart of Yorkville, surrounded by its upscale restaurants, shops, museums and galleries. Bloor subway station is just around the corner, and the DVP is just down the street. In the past 90 days, a total of three units have sold at 18 Yorkville with prices ranging from $430,000 for a small 1-BR suite to $2,100,000 for a large 2+Den. These properties spent an average of 34 days on the market. Eleven units were also leased at 18 Yorkville in the past 90 days, ranging from $1,450 for a 1-BR suite to $3,000 for a 2-BR suite. A furnished 1+Den commanded $3,195 during this time. For more information on 18 Yorkville, please click here. The Yorkville, coming soon to the corner of McMurrich St and Davenport Rd, will be a 31-storey tower with six executive townhomes designed by the multi-award-winning Wallman Architects. In addition to first-class area amenities such as shopping, museums, restaurants, fashion and culture, the building itself will also house Club Yorkville on the fifth floor. Residents will have the opportunity to enjoy some incredible private amenities including a piano bar and billiards room; an elegant dining room with a private wine cellar, full gourmet kitchen and catering facilities, a fully equipped fitness, cardio and yoga studio and plunge pool, not to mention a 5,000 sq ft outdoor terrace complete with BBQ, dining and lounge areas and an outdoor fireplace. Some notable suite features include 9-ft and 10-ft ceiling heights with floor-to-ceiling windows, a Signature Kitchen with a choice of natural stone or quartz countertops plus a fully integrated slim-line Miele stainless steel appliance package. All of these features are what the marketing campaign 'Yorkvillism' represents, defined as "a state of mind enjoyed by those who live in and frequent Toronto's Yorkville neighbourhood". As explained by Brian Brown, Vice President of Lifetime Developments, "this state is characterized by a discriminating passion for the very best in culture, cuisine, couture, architecture and decor." Interested in this purchasing a unit? Sizes range from 383 sq ft to 1,965 sq ft, priced from the low $300,000s to over $1.5 million. The sales centre is not yet open to the public, but you can register now online at www.theyorkville.com for preview access. Our VIP subscribers have already received the latest new condo development news and updates, delivered straight into their inboxes on Thursday morning. To be one of the first to receive the full newsletter, subscribe here. Below, a little snippet of this week's newsletter. Enjoy! As we discovered in the first two parts of this series, finding the right condo investment for your personal situation involves considering investment style, budget, location and size. While these tend to be the major factors that influence any condo investment, there are other things that will need to be considered along the way, including features such as the availability of parking, locker and building amenities and your market outlook. As the days get a little longer and the snow begins to melt, we can't help but daydream of warmer days to come. This rendering of the rooftop terrace planned for The Mercer (designed by the talented trio at The Design Agency) looks like the perfect backdrop to a lovely summer rendezvous. We love the indoor/outdoor concept: a series of urban rooms including private lounges, a games area, kitchen and dining space perfect for alfresco entertaining. A meditative reflecting pool adds an element of calm and elegance. Our favourite part? A large, wraparound screen wall where residents can watch movies outdoors on a warm summer night. Ahhhh. Suites are now available at The Mercer condos, located at 8 Mercer St in the heart of the Entertainment District, near King and John. Click here for more information. The Mercer's stylish presentation centre shines, especially at night! This week, we're heading west for a closer look at The Fountains of Edenbridge by H&R Developments, located in Etobicoke near Eglinton Ave and Royal York Rd. Completed in December 2005, this high-rise development offers its residents a range of building amenities including a fitness centre, indoor pool and sauna, as well as a party room, media room and guest suites. Its close proximity to parkland keeps residents in touch with nature, while its location offers quick access to shopping centres and public transit routes. In the past four months, a total of two units have sold at The Fountains of Edenbridge with prices ranging from $212,000 for a 1-BR unit to $247,000 for a 1+Den. These properties spent an average of 84 days on the market. For more information on The Fountains of Edenbridge, please click here. As discussed in yesterday’s post, two of the biggest factors impacting any decision to invest in a condo include one’s investment style and budget. However, these aren’t the sole considerations when it comes to your condo investment; once you’ve thought about the type of condo you’d like to invest in and how much you have to spend, you’ll have to decide where to spend your hard-earned dollars and just how much condo you’ll really want or need. Something to consider when making these decisions is your risk tolerance. The ever-expansive "condotropolis" of the Greater Toronto Area. Like this image? View the original here, by Aelita Intl. Have you heard about this week's new condo updates? If you're one of our VIP subscribers, then you've already received the latest updates and news from new condo developments, delivered straight into your inbox every Thursday morning. To be one of the first to see the full newsletter, subscribe here. > Realtors & Landlords: There's Demand for Condo Rentals on LiveHigh.com!